A solution for covering walls and studs, laminated plastic provides a unique architectural touch, enhancing the interior design of public buildings and institutions. Decolam wall-covering systems are composed of vertical panels attached by fasteners that support the panels and control alignment. 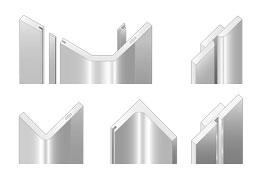 Versatile and easy-to-install, the panels are custom-made to suit specific project requirements. Boasting the complete range of features and advantages of laminated plastic, these highly resistant panels are easy to maintain and come in a wide variety of colors, patterns and finishes. The entire wall-panel installation complies with the construction standards of the following sections: masonry, metal supports, flooring and ceiling. Submit material samples for architect’s approval. Submit shop-drawings indicating dimensions, fastening methods and specifications. Handle panels with care prior to installation to protect the surface. At the building site, avoid abrupt temperature changes and store panels in a dry location sheltered from adverse weather. * Do not place the panels directly on the ground. * Humidity between 40% and 60%; temperature between 50° and 80° F (10° and 25° C) before installation. Panels come with a one (1) year warranty on materials and labour, subject to proper maintenance and normal use. This warranty does not cover damage caused by normal wear, abuse, excessive humidity or dryness, or building defects. 1. 3⁄4″ (19 mm) thick particle board with a density of 45 lb per cubic foot (720 kg/m3). 2. Laminated plastic for flat surfaces, complying with the CAN3-A172-M79 standard for general purpose grade. 3. Supporting frames and adhesives.